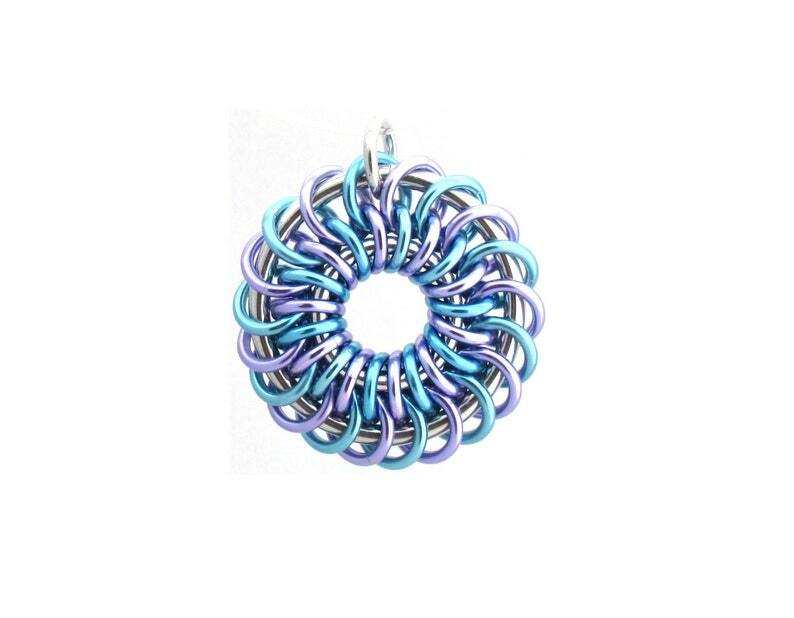 This is a fascinating chain maille pendant, with a beautiful spiral appearance. It is an intricate piece of jump ring jewelry that will look wonderful with almost any outfit! This multicolor pendant features pastel anodized aluminum jump rings in lavender purple and sky blue, as well as plain aluminum (silver colored) rings. It measures approximately 1 1/16" in diameter (not including the jump ring used as a bail). It is very lightweight and eye catching! The coloring on the jump rings is very sturdy, but it can possibly be scratched if it comes in frequent contact with a harder surface. Please keep this in mind when wearing and storing. Take a look around the rest of my shop as well!